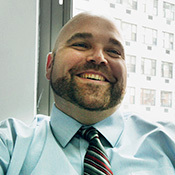 Chris Chamberlin began working in higher education in 1998 and joined The Cooper Union in October 2010. He was appointed Acting Associate Dean of Student Affairs in August 2013. One year later, in August 2014, he became Dean of Students. As the Dean of Students, Chris Chamberlin serves as the institution’s Chief Student Affairs Officer providing leadership and oversight for the Office of Student Affairs including Title IX Compliance and Investigations, Student Diversity and Inclusion Initiatives, Residential Education and Housing, the Center for Career Development, Student Activities and Campus Life, Student Government and Leadership, Student Code of Conduct, Student Disability Accommodations, Student Advocacy and Support, Mental and Physical Health, Immunization Records, and other areas related to Student Affairs. Believing that our students need to be viewed holistically, Dean Chamberlin works to ensure that the students’ voices are heard and that their needs are addressed. He works to develop and foster student-centered programs and initiatives grounded in professional educative processes that allow our students to continue to succeed both inside and outside the classroom. Dean Chamberlin has earned a Bachelor of Arts degree in Philosophy and a Master of Arts degree in Counseling both from The College of New Jersey. Dean Chamberlin also holds a Master of Education degree from Columbia University, Teachers College where he served as a member of the national research team focusing on College Educational Quality. Connecting to the larger higher education community, he maintains memberships is various higher education professional and scholarly organizations including the Student Affairs Administrators in Higher Education, College Student Educators International, Association for the Study of Higher Education, Association for Student Conduct Administration, and the American Educational Research Association. Dean Chamberlin also serves on the Board for the New York City chapter of GLSEN, an organization focusing on ensuring safe and affirming educational environments where all students can learn and grow. Dean Chamberlin co-presented “Assessing college educational quality: An inside look at academic rigor, teaching quality and learning objectives” at the Association for Institutional Research’s Annual Forum. He was also part of a team that presented the scholarly paper entitled “The Power of Measures of Quality in Higher Education: Power for Whom and How?” at the Annual Conference of the Association for the Study of Higher Education.